Former Samoa captain Semo Sititi may have as wide a knowledge and experience of rugby union as any other player in the world game. Having played in the Super 12, Guinness Premiership and Celtic League, as well as three World Cups, Sititi has a wealth of experience in terms of rugby culture. He made his test debut from the bench against Japan in 1999, whilst playing amateur rugby for the St Joseph's Marist club side in Samoa. Sititi had already represented Samoa at Sevens level, and remains an excellent representative in the short form of the game. 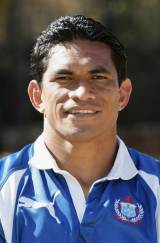 Having been included in the Samoan squad for the 1999 World Cup, Sititi made his mark by helping the team to the quarter final playoff after beating Wales in Cardiff. Sititi scored a try in the playoff against Scotland but was unable to stop his side slipping to defeat and out of the tournament. Following the retirement of the iconic Samoan captain Pat Lam after the tournament, Sititi was handed the reins at international level. He was then offered a contract by Wellington Hurricanes and played his first Super 12 season in 2000. Soon after he was on his way to Wales to play for Cardiff, beginning a six year stint in British rugby. From Cardiff, Sititi moved on to play in Scotland for the Border Reivers before spending some time in the north east of England with Newcastle Falcons. During the 2003 World Cup, Sititi contributed a moment of magic in rounding off a majestic 30 pass move to score against England in the group stages. Samoa were unable to continue their past success at World Cups however, and failed to make the quarter finals. Now plying his trade in Japan with the Docomo club, Sititi has his eyes on a fourth World Cup in New Zealand in 2011. Sititi's plans took a setback when he was left out of the squad for the Pacific Five Nations in early 2008 alongside several other notable big name players.